This site is pleasantly situated on natural wooded hillside. It is about 300 m. from a small lake with clean water, where the site has a beach of coarse sand and a large grassy meadow where inflatable boats can be kept. There is also a small bar and a sunbathing area for naturists, although this is not a naturist site. The 250 pitches for touring units are on individual, level terraces, many with light shade and all with 8/16A electricity (adaptors are required on some pitches, and can be collected from outside reception). There are 154 pitches that also have water, drainage and satellite TV. A further 47 pitches are occupied by a tour operator, and there are also mobile homes for rental. English is spoken. This part of Carinthia is a little off the beaten track but the site still becomes full in season. 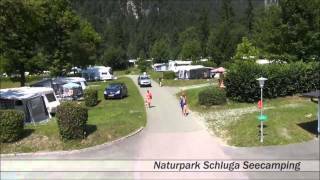 Close by is Schluga Camping, under the same ownership, which is open all year. From both sites, there are views of the mountains, snow-capped in early summer. Many walks and attractive car drives are available in the area. Four heated modern toilet blocks are well constructed, with some washbasins in cabins and family washrooms to rent. 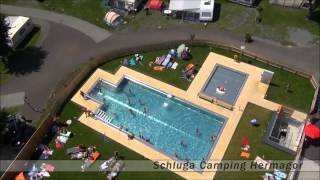 Facilities for disabled campers. Washing machines and dryer. Motorhome services. Shop (20/5-10/9). Restaurant/bar by entrance and takeaway (all 20/5-10/9). Heated outdoor pool with toddler pool. Playground. Room for young people and children. Films. Kiosk and bar with terrace at beach. Surf school. Pedalo and canoe hire. Aqua jump and Iceberg. Pony rides. Bicycle hire. Weekly activity programme with mountain walks and climbs. Internet point. WiFi over site (charged). Site is on the B111 road (Villach-Hermagor) 6 km. east of Hermagor town.